You might love or hate this smart lamp's design, but it's practically a must have if you use C by GE smart bulbs. What it’s like to use the C by GE Sol? Should you put a C by GE Sol in your home? 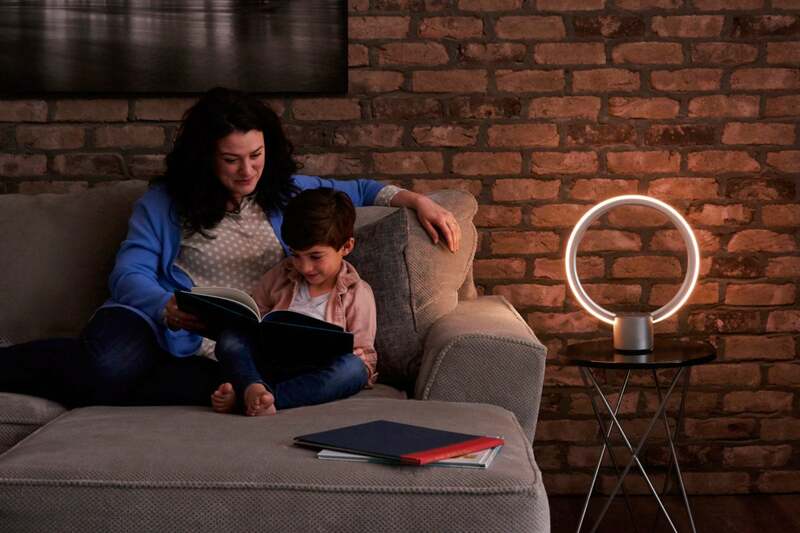 The C by GE Sol ($200) is the first lamp I’ve seen that fully incorporates Amazon’s Alexa digital assistant. 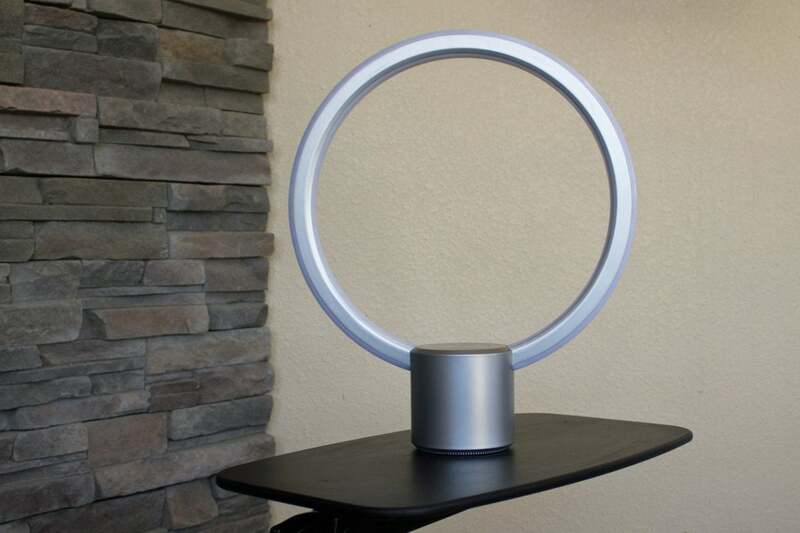 If you can get past its 1950s sci-fi aesthetic, it could be a good addition to your smart home. This goes double if you also use C by GE smart bulbs. I control 95 percent of my home’s indoor and outdoor lighting using Amazon Echos and Echo Dots, so I’m accustomed to the convenience that the Sol offers. (It’s pronounced “soul,” by the way, not “saul.” I used the latter pronunciation a few times, and Alexa kept hearing “salt.”) But in addition to letting you use voice commands to control the lamp’s brightness, the Sol also lets you use voice commands to change the color temperature of its outer white LED light ring, from a cool 6,500K to a warm 2,000K (the inner LED ring is reserved for visual feedback—more on that later). The Sol doesn’t produce a lot of light, hitting just 550 lumens at its peak. 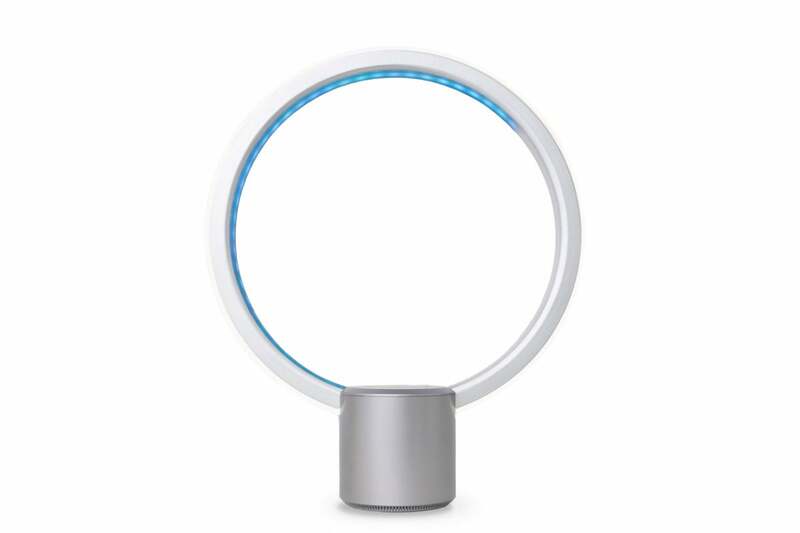 The C by GE teams tells me this is about the equivalent of a 60-watt bulb inside a lampshade, but a lampshade directs the light from the bulb it surrounds. The Sol’s light ring diffuses everywhere and is concentrated nowhere. I didn’t find it sufficient to read a magazine by (it seems all the books I read nowadays are on a backlit Kindle). I'm convinced the Sol is not the only light source in this photo. I found its 550 lumens much too dim to read by. In addition to being a nearly complete Echo clone, the Sol has a built-in Wi-Fi/Bluetooth bridge. That enables you to use voice commands to also control any C by GE smart bulbs in your home—adjusting the brightness of the C-Life and C-Sleep and tweaking the color temperature of the C-Sleep. In addition to those features, the bridge enables you to control the Sol and C by GE bulbs remotely, as well as put them on schedules. Those improvements resolve some of the past criticism we’ve had of GE’s Bluetooth bulbs. Last May, GE announced a standalone bridge—the C-Reach—that will do the same thing if you have C by GE bulbs don’t want the Sol. GE intends to add HomeKit compatibility down the road. As I mentioned earlier, LEDs line the Sol’s inside ring, too, but these are used only for visual feedback. Summon Alexa, and a series of blue dots will travel up the left and right sides of the inner ring until the entire ring is lit with them. When Alexa responds, the dots briefly shift to a grayish white and then back to blue before turning off by traveling back down the left and right sides of the ring. 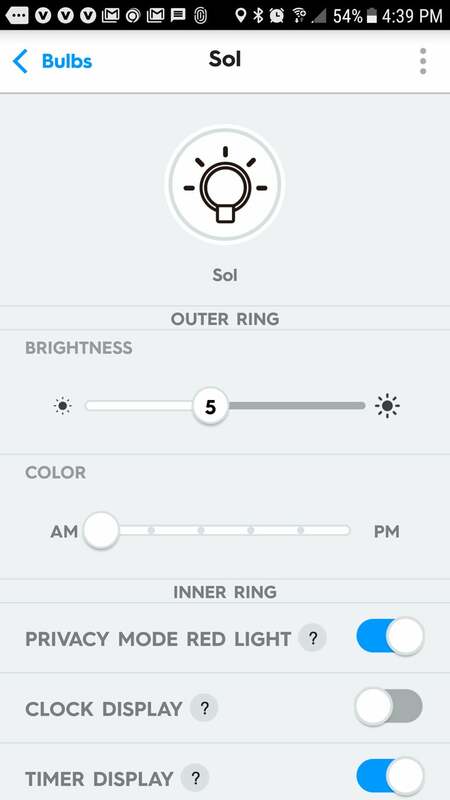 The inner ring has other functions, which you can enable and disable using the C by GE app. Mute the Sol’s microphone, and the inner ring glows red, just as Amazon’s own smart speakers do (although the Sol’s much larger size makes it look as though there’s an emergency in your house). Ask Alexa to set a timer, and the inner ring will light up with grayish dots that disappear as the timer counts down. When the timer is up, you’ll hear the familiar Alexa chime. If the Sol encounters a communication problem, the inner ring glows yellow. LEDs in the inner ring count down when you set a timer. The Sol’s inner ring has one other dubious trick up its sleeve: Using three blue LEDs to indicate the hour and one red LED to indicate minutes, it can display an abstract clock face. As you probably guessed, I turned that function off right away. The top of the Sol’s base is a touch-sensitive surface with controls for turning the light on and off and adjusting the outer light ring’s brightness. You can tap these buttons to incrementally increase or decrease brightness, or you can hold your finger on top of them to do the same continuously. The light ring brightens and dims in steps, though, not a smooth arc. You can do the same for volume control, but in this case, you get visual feedback from the inner light ring (it turns off when you’ve finished making your adjustments). There are physical buttons for muting the Sol’s mic and for summoning Alexa silently. You can control the brightness and color temperature of the outer ring, and you can turn most of the functions of the inner ring on or off. The Sol’s speaker is decidedly mediocre—a few steps above a transistor radio, with very little in the way of dynamic range and virtually no bass response. This wouldn’t be a big deal if GE thought to include an analog audio output, as every Echo does, so you can add your own powered speakers. But they didn’t. The Sol doesn’t support Bluetooth streaming, either, so you’re stuck with that crappy audio performance. It’s a bit of shame. Speaking of music, you can stream music from Amazon Music, iHeartRadio, TuneIn, or SiriusXM; but unlike with Amazon’s own Echo smart speakers, you can’t stream Spotify Premium or Pandora. The Sol does support Spotify Connect, so you can stream Spotify music to it its speaker, but you can’t control Spotify with voice commands. The C by GE app has improved greatly since I used it last. 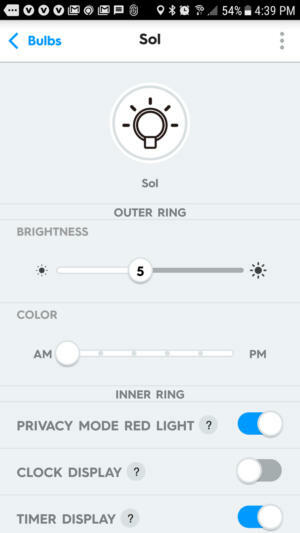 You can use it to create custom lighting scenes and schedules using the Sol as well as the C by GE Bluetooth smart bulbs (C-Life and C-Sleep). The app comes with suggested scenes—Wake Up, Bedtime, Get Home, and Movie Time—but these are just names, you need to set them up. You can create as many more scenes as you like, each with a custom name. In each case, you first select any C by GE devices you want to be turned off when the scene is triggered, and then you select which lights you want turned on. You can set the brightness and color temperature for each bulb. Brightness is on a scale of 1 to 10, but color temperature is more abstract: There’s a slider with AM at the right, PM at the left, and five notches between them. The closer you get to AM, the cooler the light; the closer you get to PM, the warmer the light. You can also group bulbs together and assign them names, so you can control multiple bulbs at once. Once you’ve created some scenes and/or groups, you can assign them to operate on simple schedules. By simple, I mean you can program a group or a scene to turn on at a specific time and off and a specific time, and you can have that schedule repeat on a 7-day-per-week basis (every day, every Monday, every Monday and Wednesday, and so on). The photo on the left shows what the Sol's "daylight" setting looks like. The shot on the right shows its "soft white" setting. The Sol’s industrial design is decidedly polarizing: One glance and you’ll either love it or hate it. While it doesn’t fit with my home’s loosely mission-style décor, I can’t complain about the quality of its light (although I can’t say the same for the volume of its light). If you’re using C by GE smart bulbs, it’s practically a must have until the C-Reach comes to market. During my evaluation period, the Sol performed every bit as well as any of my other Echos and Echo Dots—at least as far as a voice-controlled smart home interface. I’m very disappointed with its performance as a speaker, and unlike the Echos, GE provides no workaround for that shortcoming. Then again, if you’re like me, you use other speakers for music listening and you won’t care that this one sounds like crap. 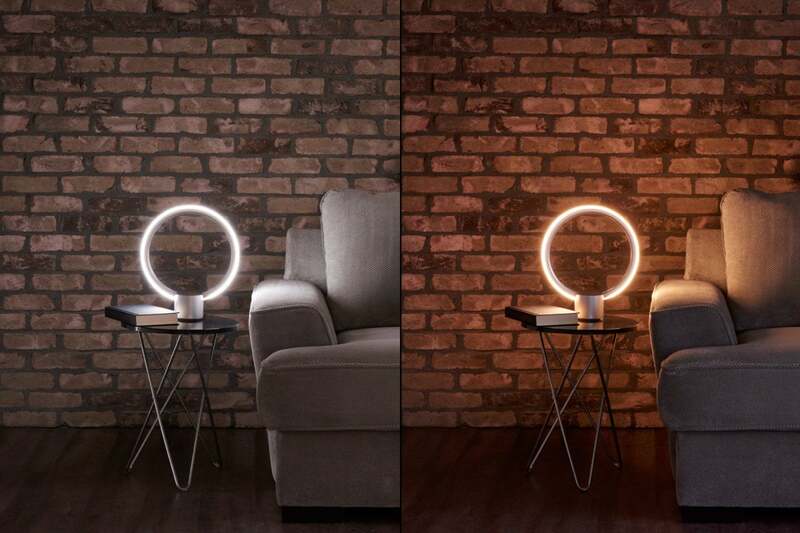 This voice-controlled smart lamp won't light up a room, but it can summon Alexa and is practically a must-have product if you're using C by GE smart bulbs.